It's about 12:20pm on the Friday of a bank holiday weekend and my brother Josh and I have just stepped off the train from Cardiff, slightly hungover after one beer too many in the Urban Tap House the night before. We make our way to the arrivals boards and locate the platform on which the train carrying the rest of The University of Exeter's Real Ale Society will soon arrive. The train pulls in and a group of burly men dressed in sailors uniforms stumble off, chanting boisterously and already looking somewhat worse for wear. Luckily this isn't my friends, but a group on a stag-do. "I hope they're not headed where we're heading," I remark to Josh, who laughs nervously in agreement. Thankfully, that was the last we saw of the band of merry men, who unlike us, obviously weren't as fussed about sussing out the best beer Bristol has to offer. A few minutes later, the remaining twelve members of our group appear and we set off in search of liquid refreshment to soothe our aching heads. Our first port of call is The Moor Brewery Tap, located about a ten minute walk from the station. As we approach, I wonder aloud just exactly how much of my short adult life has been spent seeking out obscure watering holes on industrial estates, much to the amusement of the rest of the group. Since opening in 2014 after the brewery moved into the city from Pitney, The Moor Tap has become one of my favourite spots to drink at, and is a staple of any visit to Bristol. The Tap is a single rectangular room bolted onto the front of the brewery, decorated with a mixture of Moor merchandise and Star Wars paraphernalia. Featuring ten keg lines of Moor’s beers on rotation, as well as cans, bottles, growlers and T shirts to take away, it’s the ideal place for us to start our crawl. We pile into the small room and order thirteen halves straight away. The majority of the group plump for So’Hop, a 4.1% Pale hopped entirely with Southern Hemisphere hops that slides down our thirsty gullets all too quickly. On the day of our visit, the Tap are hosting a three day party with live music, street food and two new beers. Unfortunately for us, Friday’s food offering – MEATliquour burgers – don’t arrive until 5pm. Fortunately for us, however, the first of their new beers - Pale Modern Ale – is already on the bar ready for us to sample. A real juicy banger of a Pale Ale, with a little more of a malty backbone than the So’Hop, PMA is the ideal second half pint of the day. We stay at Moor until around half two, and even then are reluctant to leave, so good is the beer, company and hospitality. We even get to meet Baz, the resident brewery dog, although he seemed more interested in eating our packed lunches than saying hello to us. 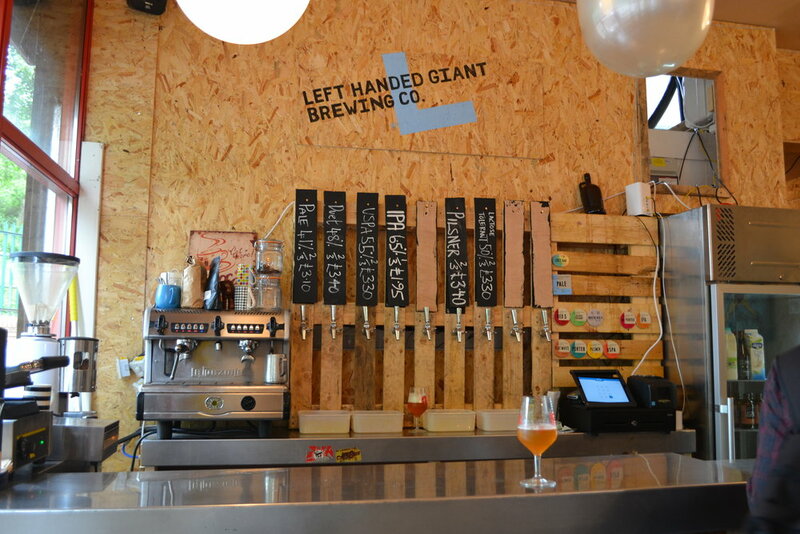 Thoroughly refreshed and feeling very content, we leave Moor behind and head further into the industrial estate to visit Left Handed Giant Brewing Company, who very kindly agreed to open their brewery tap early to accommodate for our visit. With only five beers on tap, the selection isn’t quite as extensive as Moor, but the US Pale ale is as good as anything I’d had up to that point in the day. Jack, Bruce and Eddie are hard at work when we arrive, but are only to happy to show us around the site whilst we enjoy their beers. Jack takes us into the back and shows us their 200 litre brew-kit which they use to test their recipes and make some of their more experimental brews. Having opened early in 2015, they use commercial brewing equipment from other breweries to make the majority of their beer and supply Small Bar on King Street as well as numerous other pubs in the South-West. With the weather holding up for the time being, we head outside to enjoy some more beers and play basketball with an improvised hoop attached to a fork-lift that had been set up by Jack and Eddie that very afternoon. All too quickly we had to move on. With time of the essence and lots of pubs still to visit, we bid farewell to Left Handed Giant and head for town. Next up was a quick visit to Brewdog Bristol on the bank of the river. We arrive somewhat flustered and just in time, with the heavens promptly opening and drenching the masses that had just finished work for the weekend. Initially we decide to just stay for the one drink before heading to King Street, but Joshua has other ideas, using his Brewdog bucks to purchase four beers including a half of Stone’s latest Russian Imperial Stout. With the weather trapping us for the time being, we all take it in turns to steal sips of Joshua’s beer and make light work of our own drinks. The bar was soon heaving with thirsty punters and we make our escape during a brief break in the downpour and make the short walk to King Street. I never fully understood the expression “Like a kid in a candy shop” until I first visited King Street back in 2014. The sheer number of superb pubs to chose from, all located within a two minute or so walk from each other, is a beer geek’s paradise, and we waste no time in heading for The Beer Emporium to continue boozing. The bar is located entirely underground and has an almost Belgian feel to it, which is definitely not a bad thing to try and imitate. After drinking almost exclusively keg beers until this point, I opt for New Bristol brewery’s Japan, a 4.8% Pale with Japanese Green Tea, which is in excellent condition on cask and has a very floral and slightly sweet taste. We only stay for the one half in the Emporium, mainly due to the effects of a solid five hours of drinking with only packed lunches to sustain us. Before we could get dinner and settle for the evening, we had one more stop to make. The Famous Royal Navy Volunteer is an old fashioned-looking pub located just up the road from The Beer Emporium, and the previous night had hosted a Siren tap takeover, with 29 beers from the Berkshire based brewery on tap. At this point in proceedings, I make the very sensible decision to go for The Chardonnay barrel aged version of Life’s a Peach, coming in at a whopping 8% proof. Needless to say, this knocks me out of action for a while, so I retreat outside to enjoy a spot of people watching on the bustling King Street whilst the rest of the group seeks out dinner. Our final pub of the day is just across the road and is probably my favourite out of the plethora on offer on King Street. Small Bar is everything a proper pub should be, with superb beer choice, excellent spirits, and most importantly at this point, good grub. I grab a token from Ed to exchange for a third of Omega, a 6% Belgian sour from Brouwerij Alvinne and order a Butternut squash with cheese, hand-cut fries and salsa. I am soon cursing my vegetarian diet, however, when a disappointingly undercooked squash arrives twenty five minutes or so later. Nonetheless, this small blip on my day is soon remedied by the purchase of half a Cloudwater Imperial Stout; we're firmly into the silly beer part of the evening by this point. I'm the only one feeling a little worse for wear, with Joshua having bitten off more than he could chew in Brewdog and drunkenly announcing he had to go home, before promptly returning twenty minutes later and continuing to drink. We round off the evening with a swift half of Siren Caribbean Chocolate Cake in The Volunteer before running through the rain back to the station in time to catch the train back to Exeter. All in all, it is a fantastically boozy day out and a fitting send off to cap three brilliant years of involvement with the Real Ale Society. A special thanks must go to Ed for steering the ship so admirably throughout his time as President, and to the bar staff, owners and brewers at all the brilliant pubs, breweries and tap-rooms we visited over the course of the day, and those we didn't have the time to make it to. Bristol truly is an incredible city for beer, and my only regret would be not making the trip more often throughout my three years of university in Exeter.